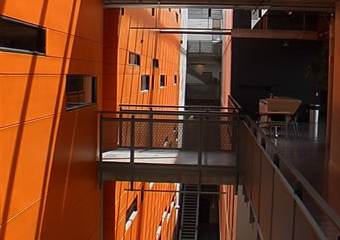 In 2004, the Wuest Group moved into a new building, the Pavillon J.-A. 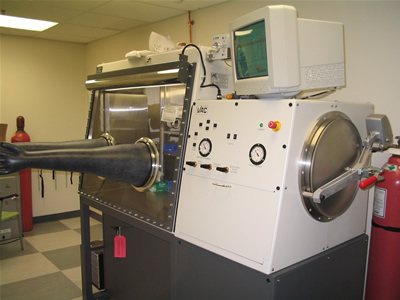 Bombardier (PJAB), which has been designed for interdisciplinary research in materials science, nanotechnology, and related areas. Through major new funding, provided in part by the Canada Foundation for Innovation, PJAB has been equipped with an impressive set of tools for the type of research we do. Key facilities are 1) a world-class laboratory for X-ray diffraction featuring three new instruments, including a rotating-anode single-crystal diffractometer with special focusing optics and a robotic sample holder; and 2) a laboratory for high-throughput synthesis and crystallization. The following photos provide a virtual tour of our new home. Come visit us! Each laboratory module contains eight hoods 1.5 m in width. 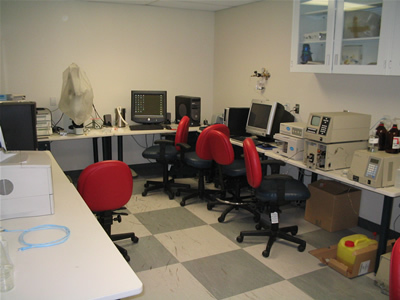 An adjacent laboratory is equipped with two glove boxes. 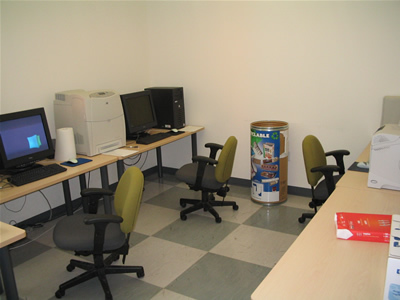 Office space is separated from the laboratories but on the same floor, and it includes a room for computers and molecular modeling. 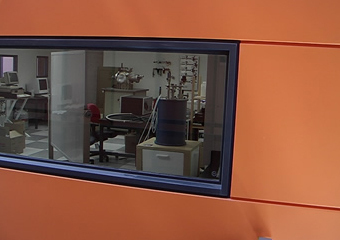 Group facilities include a laboratory for analysis, including instrumentation for DSC, TGA and optical microscopy. 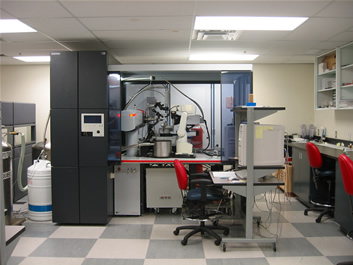 View of the X-ray crystallography laboratory, showing the single-crystal Bruker AXS X8 Proteum diffractometer equipped with a robot for handling samples. 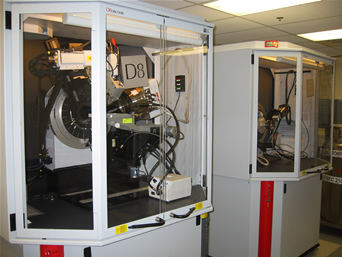 View of the X-ray crystallography laboratory, showing the Bruker AXS D8 Advance powder diffractometer and the high-throughput D8 Discover diffractometer. The laboratories are separated from the offices. They are accessible by footbridges. 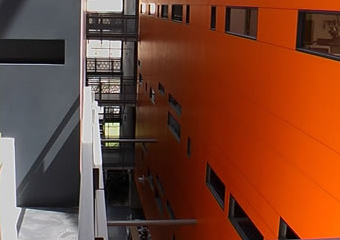 The laboratories are located in the orange block. 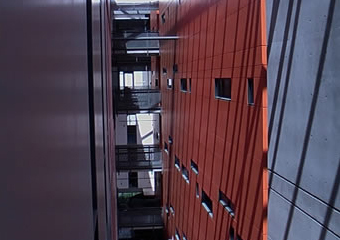 View of the hallway between the laboratories and the offices. 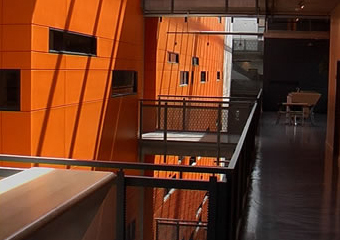 The building was constructed to maximize natural lighting. 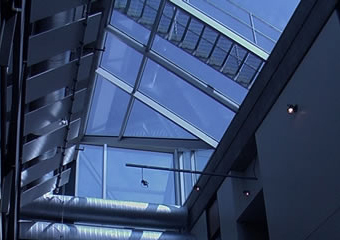 Sunlight is used as a primary light source with the help of skylights. 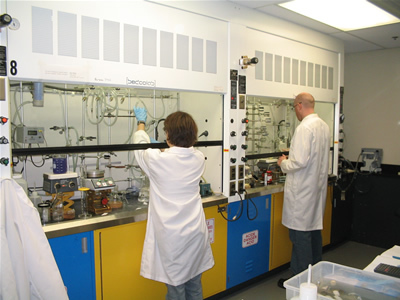 Laboratories are equipped with state-of-the-art machinery.